Secure your job offer now! 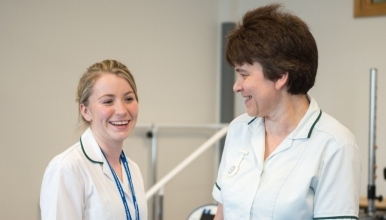 We are looking for enthusiastic, newly qualified and existing Band 5 Occupational Therapists to join our friendly team of Therapists working on a rotational basis across both The Royal Shrewsbury Hospital and The Princess Royal Hospital, Telford. We offer a robust training and development programme and a competency system for all our band 5's and provide support for development opportunities. Please download the person specification and job description to view full details of the role. All rotations have a robust competency framework and mentorship system with appraisals at regular periods across the rotation with a full appraisal annually. You are supported by a stable team of experienced staff, headed by a Therapy-led Management Team. Pre-registration positions at Band 4 level until HCPC registration is complete. Successful applicants can automatically join the therapy bank to pick up shifts whilst still studying (at a Band 2 level). Shropshire is a fantastic area and a great place to enjoy many physical activities such as: biking, running, hiking, and even more for the more adventurous of you. This is your opportunity to see the hospital, meet the team, and secure a job offer straight away – why not come along and see what we have to offer? Please note: All staff are expected to work across a seven day service as required on a rota basis.